Our Honey Treasures range for dry, fragile hair prone to breakage. From root to tip, hair feels stronger, as if restored. Weightlessly nourishes, reinforces and helps to protect fragile hair from breaking. Hair feels healthier and more resilient from the first wash. Enriched with natural ingredients extracts: propolis, royal jelly and honey. 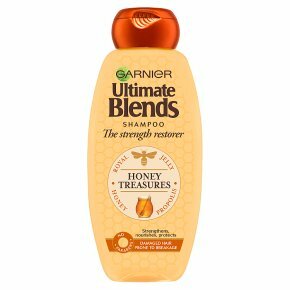 Garnier Ultimate Blends Honey Strengthening Range for dry, fragile hair prone to breakage. - The Strength Restorer: our ultimate care blended with propolis, royal jelly and honey for naturally beautiful hair. - Up to 6x stronger hair, and up to 84% less breakage. * (*Resistance to brushing. Shampoo, conditioner and serum vs classic shampoo. Bleached hair) Beautiful bees make beautiful hair. Nature's hardest workers give us three treasures from the beehive: protective propolis, precious royal jelly and heavenly honey, blended with love. The sweetly scented, gently-restorative formula will leave your hair feeling stronger and looking healthier from root to tip. Bee-utiful. Discover The Strength Restorer's naturally derived ingredients: Extremely rich in sugar, honey offers deep nourishment for hair without weighing it down, as well as providing a beautiful smell. Propolis is a natural resin produced by bees used to protect and fill gaps in their beehives. Its action on hair is much the same by forming a powerful protective barrier, and becomes the perfect ingredient when you're wondering how to treat damaged hair. Royal jelly, also known as 'bee's milk', is a nutrient-rich concentrate that's very high in vitamin B. No wonder it's best friends with fragile and over-treated hair. How to Apply Garnier Ultimate Blends Honey Strengthening Shampoo: Massage our Honey Strengthening Shampoo into wet hair. Lather, rinse, and follow with our Conditioner for Damaged Hair. For intense care, indulge in our Honey Hair Mask, and for extra resistance to breakage finish with our Honey Strengthening Serum. In case of contact with eyes, rinse immediately.<br>Do not swallow. Keep out of the reach of children.